I would venture to say that most of us consider pineapples to be a rather exotic, tropical fruit, right? While commercial pineapple cultivation does indeed occur primarily in tropical regions, the great news is that you too can grow pineapple plants in the garden, and it’s easy! Read on to find out how to grow pineapple plants and useful information regarding pineapple plant care. Pineapples are a tropical herbaceous perennial belonging to the bromeliad family. They grow to about 5 feet in height with a 3- to 4-foot spread. The idea that pineapples are an exotic, decadent fruit isn’t farfetched. They were first introduced to Europe in the 1700’s where they were delicacies of great value sought after only by the very wealthy. Growing pineapples really is very simple. Because of their tough leaves, they lose little water through evaporation. 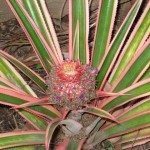 They have small root systems like other bromeliads, and are not fussy about the quality or quantity of their soil. Due to this, they make excellent container grown plants, especially nice for those of us whose climate is less than tropical. If you do live in a warmer region, growing pineapple plants in the garden is a match made in heaven. To start growing pineapples, you’ll either need the top of a store-bought pineapple or if you know someone that is growing their own, ask for a sucker or slip. If you’re using the top of a purchased pineapple, make sure to remove all the fruit pulp as well as the small bottom leaves. Remove the small leaves from the bottom of the suckers too. Just pull them off. Then, simply dig a shallow hole in the garden or in a pot and plunk the top or sucker into it. Choose a sunny spot, if possible, although pineapples will grow in dappled shade. Firm the soil around the base, and if the soil is dry, give the plant some water. If you are planting multiple pineapples, give them at least a foot between each plant. Be sure not to plant them in an area that gets standing water or tends to be soggy. That’s it really. The care of pineapple plants is just as simple. Pineapples are fairly drought tolerant and can thrive with very little water. If you are in a low water area, or if you never remember to water your plants, a thick layer of mulch should be incorporated to reduce evaporation. You might also want to consider growing your pineapples in a slightly shaded area, especially if you live in a tropical or sub-tropical area. If, however, you live in a region with plentiful rain, that’s okay too. 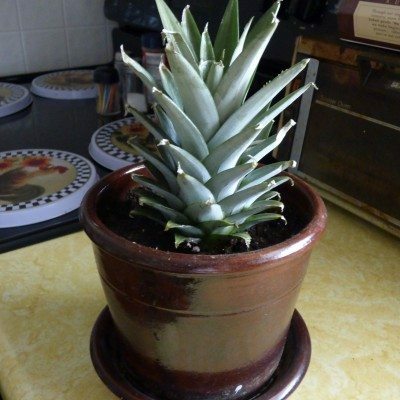 If you have the pineapple in a pot, be sure it has well-draining soil and drainage holes. Don’t drown the pineapple by overwatering though! Additional pineapple plant care is minimal. Pineapple leaves uptake most of their nutrition. For the first few months after planting, just leave the plant alone — no fertilizer, that is. After that, you can use liquid fertilizer such as fish emulsion or seaweed extract. Make a diluted solution and use a watering can to apply to the soil and the leaves. Stay away from artificial or concentrated fertilizers, which can burn the plant. If you use chicken manure, sprinkle it on the soil at the base of the plant and into the bottom leaves. The color of the leaves will be a telltale sign of whether or not to feed the plant. If they get a reddish/purple tinge, it’s time to feed the pineapple. The ideal way to feed your pineapple is to incorporate compost into the soil prior to planting and mulch heavily around the plant. Some of the mulch/compost will end up in the lower leaves as well as around the shallow root system, and as it breaks down, it will nourish the plant. The only other thing to pay attention to is if you live in a cooler climate. If so, then you probably have the pineapple outdoors in a pot. Be sure to move the plant inside in an area with lots of sun as the weather begins to cool. Pineapples are no match for frost, so move it inside well before the weather turns.